Few politicians – if they aren’t party leader – face as much discussion of their popularity as George Osborne does. He’s dominant enough in his party to be favourite as next Prime Minister, but too soft, constrained or cautious to do a Gordon Brown and crush his rivals. So the leadership contest will be competitive and Osborne’s public unpopularity is seen as his weakness. The Chancellor is clearly aware of this and hasn’t disguised his efforts to become liked, with his haircut, weight loss and hard-hat regimes. This explains the relentless discussion among political commentators of Osborne’s popularity, which has re-emerged this week. The usual description is that Osborne was initially hated as a slashing Chancellor; this is supposed to have reached a nadir with the Omnishambles budget and his being booed at the Paralympics. Then, he had a makeover which caused everyone to start liking him. The tax credits debacle has now been added to this, with recent claims that his popularity is tumbling. I’ve been meaning to write about this for a while as it has all the elements for me to do one of my favourite kind of articles: one where I muster my powers of pedantry to declare a widely accepted ‘fact’ to be nonsense. There’s a conventional wisdom, that’s seemingly not backed up with numbers and resting on an assumption that most members of the public closely follow political happenings. In fact, there’s a data series that seems to back up the conventional wisdom quite well. 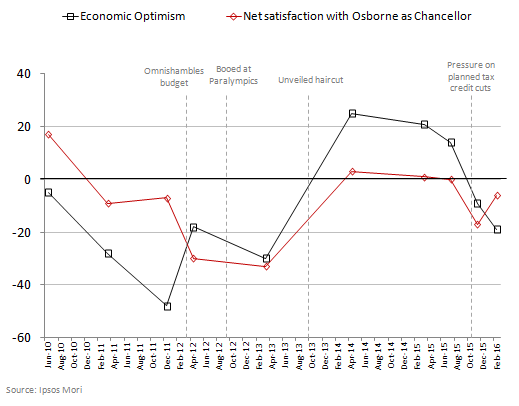 Ipsos Mori regularly test satisfaction with the Chancellor of the day, and the results show pretty much what’s described. 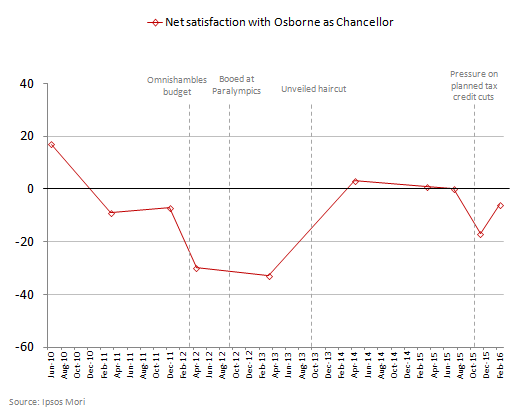 Osborne was seen to be doing a good job at first, then his numbers tanked, then – after the Paralympics – they picked up again. Recently they’ve fallen a little. But I don’t think this measures what we actually want to know. The question of whether Osborne is seen to be doing a good job as Chancellor might not say much about whether people would be happy to see him as Prime Minister (which is ultimately what we’re interested in). In fact, to a fair extent, it measures how well people think the economy is doing. Comparing the data to Mori’s question on public confidence in the economy shows that the two have generally moved in tandem (the correlation is about 0.5). So if we have another recession, we should expect Osborne’s job approval ratings to fall. If not, they might recover (though the relationship didn’t particularly seem to hold under Darling or Brown; it could be that the correlation is a coincidence or, for some reason, people are now less willing to accept downturns as being beyond the Chancellor’s control than they were under Labour). But this still doesn’t really tell us whether the public actually like Osborne, and whether their view has been influenced by his rebranding. I was back on Polling Matters this week, talking about the US primaries, the EU referendum and Labour’s terrible poll ratings. My first time back on Polling Matters for a while, in time for the pilot of a TV format. As Keiran says, faces for radio. Apologies for the brain fade in my first answer. Is Euroscepticism collapsing, or is it just bad polling? © Leo Barasi 2019. All rights reserved. Powered by WordPress.